Home HazCom holidays industrial hygiene Industrious Hygienist NAOSH north american occupational safety and health week occupational safety and health professional OSHA safety worker exposure How I am celebrating Occupational Safety and Health Professional Day! How I am celebrating Occupational Safety and Health Professional Day! Howdy, loyal readers! Today is Occupational Safety and Health Professional Day. I'll tell you how I am celebrating, but first I want to let you know what this day is all about. The American Society of Safety Engineers (ASSE) started this recognition day in 2006. 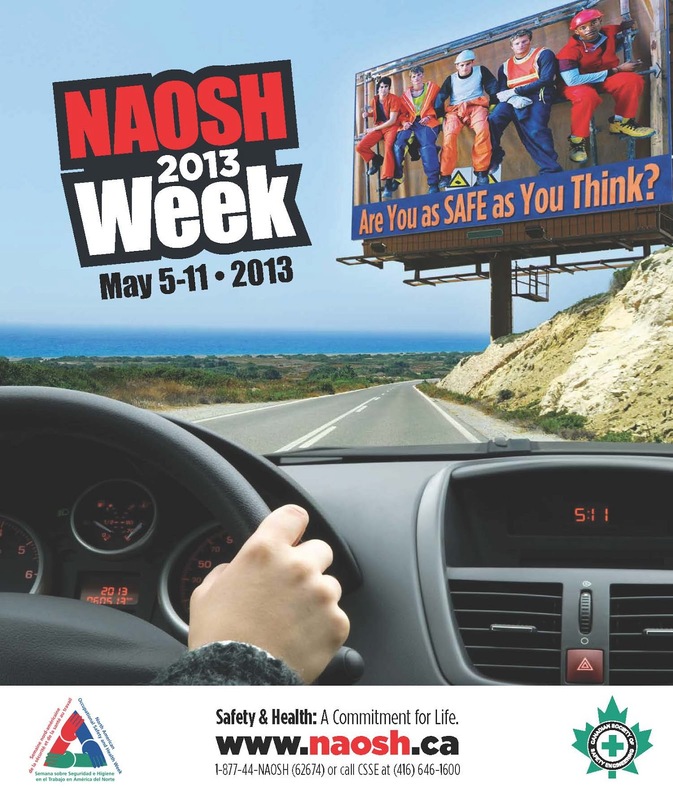 It is held in the middle of North American Occupational Safety and Health (NAOSH) Week, which is this week, May 5 to 11, 2013. Here's a NAOSH marketing poster for the week-long celebration of safety and health in workplaces and homes. Image courtesy of NAOSH promotional materials website.
? They have the slogan "Safety and Health: A Commitment for Life" and the website has events (mostly in Canada, since it is "North American" and includes Canada, Mexico, and the U.S.), resources, partners, and promotional materials for communities or companies. My favorite promotional item is the Safety Checklist, which is written for Canadian regulations but can be easily modified for U.S. regulations. The checklist has the theme "How Safe Are You!" I like that they used the exclamation point (!) rather than making it a question (?) - it feels more like a challenge. Checklist courtesy of the NAOSH promotional materials website. 1.) Does your workplace have a written, up-to-date and posted health and safety policy and a program to implement the policy? 2.) Does everyone in your workplace know their current obligations under the [Occupational Safety and Health Act of 1970], as well as the relevant regulations and amendments? 3.) Does everyone know the worker representative or committee members whose role it is to address health and safety issues? 4.) Does your workplace have a system to conduct planned health and safety inspections that includes training, responsibilities, and checklists? 7.) Is the [Hazard Communication Program] current and reviewed annually and when materials or processes change? 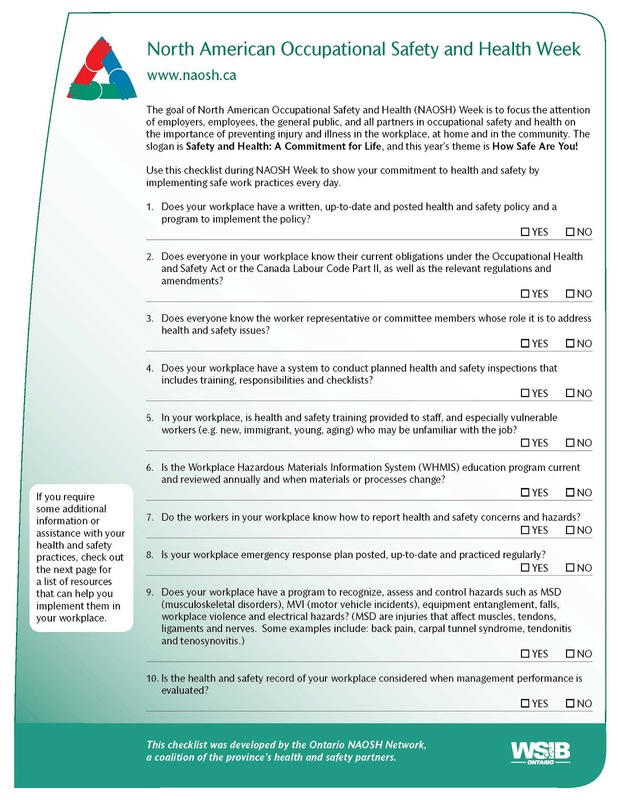 I'll stop on this question for two reasons: a) because you can look this checklist up yourself and see how your workplace is doing, and b) because the Hazard Communication Program regulations (HazCom for short) in the U.S. changed recently. I've planned a series of posts on what changes will be needed in workplaces for HazCom regulatory compliance. My plans for celebrating the day are pretty simple. I am going to keep doing my job as an occupational safety and health professional. Since I sit at a desk for much of the day, I am going to stave off some musculoskeletal disorders (MSDs) and do about an hour of yoga in the afternoon. Since I drive around a lot for projects, I am going to make an appointment to get my car serviced, and prevent a potential motor vehicle incident (MVI). Mostly I plan to promote the Occupational Safety and Health Professional Day and NAOSH week to any unsuspecting blog reader or LinkedIn member I can get to listen.